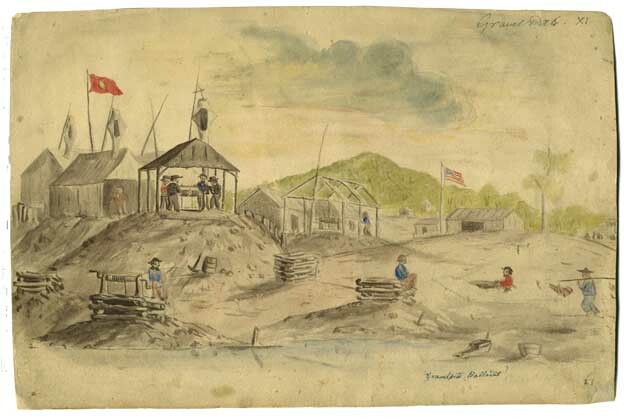 Charles A. Doudiet, Gravel Pits Ballarat, 1854, watercolour, pen and ink on paper. There is an interesting preoccupation with foreigners at Eureka. Governor Charles Hotham reports to Sir William Denison on 04 Dececember 1854 states ‘The insurgents are principally foreigners, well drilled, and said to be well commanded’. Were they principally foreigners? If not why did they stand out to the extent the posters and communications suggest? Looking at the term foreigner in Colonial Victoria we could simply define a foreigner as non British. Many were non-English speakers, but English speakers such as Canadians and Americans also fell inside the 'foreign' description. The Macquarie Dictionary includes definitions for the word foreigner in a number of ways. If you consider chart above with the use of the words 'Foreigner' and 'Alien' during the Eureka Stockade it would be easy to deide that every person at the Eureka Stockade was a foreigner. Definition 7 considers the word foreigner from a legal point of view, and uses the term Alien. According to the Macquarie Dictionary an alien is a person from another country, who is not naturalised and is not therefore entitled to the privileges of a citizen, or, as definition 5 suggests, someone living under another government or in another country than that of one’s birth. 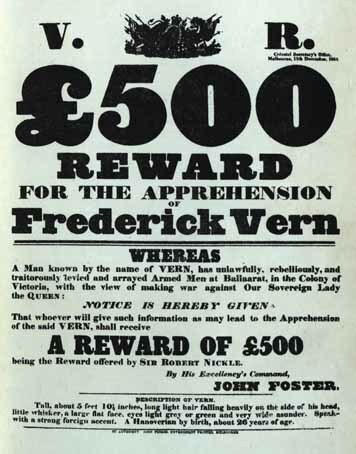 During the Eureka Stockade era any non-British subject was considered a foreigner - they were strangers receiving the hospitality and protection of Queen Victoria. 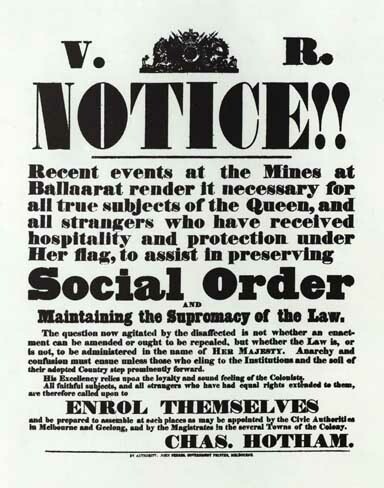 Recent events at the Mines at Ballarat render it necessary for all true subjects of the Queen, and all strangers who have received hospitality and protection under Her flag, to assist in preserving Social Order and maintaining the Supremacy of the Law. It is interesting to consider Hotham’s use of the phrase ‘true subjects of the Queen’. The Irish were British subjects, but the South Irish in particular may have preferred NOT to be described in that manner. Would J.B. Humffray have described himself as British or Welsh? The term Stranger is also interesting. In this context it means a foreigner – but is also has the word STRANGE within it. Foreigners were seen as different. According to the Victorian Census of 1854 Ballarat had the highest goldfield population with 18,564 people, followed by Sandhurst with 15,953. The Ballarat goldfield had 16,974 British subjects and 1,585 foreigners – or roughly about 1 foreigner for every 8 British subjects. Interestingly Sandhurst had 13,212 British subjects and 2,693 Foreign Subjects or 1 foreigner for every 5 British subjects. Clearly there are a lot more British than foreigners on the goldfields, and of the foreigners, the largest percentage were on the goldfields compared to other parts of the colony. Out of all British subjects in Victoria 27.45% were located on the goldfields, with 58.74 % of all Foreigners in Victoria were located on the goldfields. Many foreigners on the goldfield had been involved with radical movements of 1848, such as Italian wars of Independence, and the French Revolution. The Victorian goldfields offered the opportunity to turn over the normal social order and start a new, fresh start in the South. It is interesting to consider the 'Social Order' poster in light of the many different ways it may have been received depending on the experience and viewpoint of the reader. What if you hadn’t received hospitality and protection under the flag (Chinese)? what if you weren’t a true subject of the Queen (Irish)? What if you were a stranger who had NOT had equal rights extended to them? How would a translator would have translated it to a non-English speaker. We can't answer these questions in hindsight, but we could try to empathise with differing groups. Up until 1863 Aliens, or non-British foreigners, could not own land in Victoria. As a result many were naturalised to enable them to purchase property. In 1865 those applying for naturalisaton had to "sincerely promise and swear that I will be faithful and bear true allegiance to her Majesty Queen Victoria, as lawful Sovereign of the United Kingdom of Great Britain and Ireland, and this Colony of Victoria – So help be God." The naturalisaton papers are some of my favourite records. We can gain a lot of insight from them for example Raffaello Carboni, the Italian tried for treason, applies to Governor Charles Hotham in 1855 for naturalisation. In the previous year he had been involved at the Eureka Stockade, been tried for treason, and was using the law of the day to his advantage to apply for naturalisation. He gives his name, Place of birth, Date of arrival in the colony and name of the ship, Number of years in the Colony of Victoria, and attaches certificates of character from respectable persons. He gave his reasons for naturalising - he wanted to purchase real estate and is anxious of availing himself of the privileges granted to aliens when becomes naturalised citizens. Between the foundation of the Commonwealth in 1901 and the proclamation of the Nationality and Citizen Act 1948 on 26 January 1849, British Subject remained the only formal civic status. He signed the document on 26 November 1855 and described himself as a member of the local Court Ballarat. Shamefully, Aborigines were denied the status of Australian citizens until 1967. It is often difficult to uncover information on non-English speakers. It was difficult for the English speaking authorities to communicate with them, they had strange names that were hard to remember and pronounce, and differing conventions resulting in errors such as Carboni’s name in this legal document – Charles Raphaelo. Imagine being a non-English speaker on the Ballarat Goldfields in 1854, or Carboni being arrested after the Eureka battle. How did the non-English speakers learn about the license system? How did they know about the Bakery Hill Meetings? What were they thinking while standing on Bakery Hill amidst 10,000 people listening to words they could not understand? Interpreters such as Carboni were important for around 1/8 of the population on the Ballarat goldfield. Foreigners From All Quarters Of The Globe And Of The Diggings, Came To Inquire From Me What Was The Matter Concerning So Much Excitement As Then Prevailed On Ballaarat. I translated for them the news from our 'Ballaarat Times', or from The 'Geelong Advertiser's' clever correspondent. Foreigners also produced important eye-witness accounts of the Eureka Stockade such as Carboni’s book and Charles Doudiet’s paintings. The Ballarat Reform League had aims closely aligned to Chartism. Many foreigners on Ballarat’s goldfield in 1854 brought to the goldfields ideals of freedom and liberty they had experienced in their own country. Raffaello Carboni had been an active member of the Italian Risorgimento that fought against autocratic Austrian rule and for a unified Italy. Another group who had influence were the American miners who had come via the Californian goldfields and who were noted to advocate the benefits of American-style republicanism and independence from the British. After the storming of the Eureka Stockade three Americans were taken prisoner – Charles Ferguson, John Joseph and John Kelly. James Tarleton and Dr Charles Kenworthy managed to organise the release of Ferguson and Kelly – but not John Joseph. Other foreigners were Carboni, Jan Vennick and Jacob Sorenson . About a quarter of those tried for treason after the Eureka battle were foreigners – an over representation according to population statistics. The French were the only cultural group targetted with posters in their own language. The first French citizens in Australia were convicts or free settlers who fled the French Revolution of 1789. A significant number of French arrived in Victoria seeking gold. Antoine Fauchery's photography and book "Letters From a Miner in Australia" recorded interesting aspects of life on the goldfields. 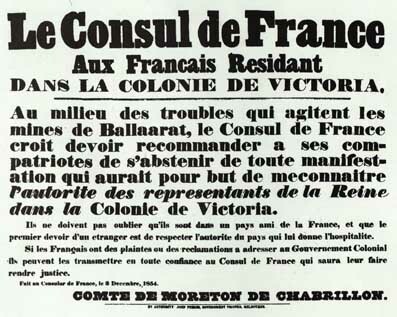 Although we can name French in Ballarat in 1854, such as Delprat, Le Pere, Peter Priaulx and Thomas Decueur, they did not rise to prominence. A number of Italian speakers from Northern Italy and the Italian speaking Swiss Canton of Ticino arrived in Australia in search of gold in teh early 1850s. Many of these immigrants first settled at Jim Crow (Daylesford) where around 10 percent of the population spoke Italian in the mid-1850s. Joseph Barberis was a spectator at the storming of the Eureka Stockade. Born at Genoa, Savoy in 1827 (it wasn’t until 1861 that Italy was unified). His father was a Parliamentary Secretary, presumably in the Savoy Parliament in Turin. 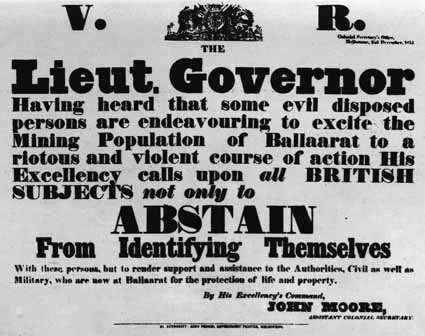 Many people assume foreigners to be uneducated peasants, but many foreigners were quite the opposite with high levels of education and a propensity to political action – a wonderful resource for the Ballarat Reform League. According Joseph Barberis’s obtuary he was educated at Genoa, but travel made him familiar with the English, French, Italian and Spanish languages. He would have been highly sought after by non-English speakers on the goldfield, especially in the later part of 1854. The first significant arrival of Canadians to Australia was after the 1837 rebellions in Canada when 150 Canadians were transported as convicts. The Victorian goldrush attracted significant numbers of Canadians, and Canadian Charles Ross was responsible for the making of the Eureka Flag. John William Wilson recalled being in a tent during with the leaders of the Ballarat Reform League. They must have been discussing a flag, and upon leaving the tent John Wilson looked up and called out "the Southern Cross, five white stars on a blue field". Ross is said to have organised its construction. Many Americans on Victoria's goldfield had experienced the Californian goldfields of 1849 bringing with them technical experience for winning gold from the ground. Americans also bought thoughts of independence from British Rule to the Victorian goldfield. It was during a dinner in Ballarat on 28 November 1854 held in the presence of the American Consul, Mr James Tarlton, that distant shouting and shots were heard, and officials left hurriedly. James McGill rushed in and whispered the password – supposedly a Celtic word ‘Faugh-a-balagh’ meaning clear the way. At the time diners knew the army was on the way to Ballarat. The president of the dinner Dr James Otway, proposed a toast to Her majesty the queen, but nobody responded. After a long silence one man stood and said ‘While I and my fellow colonists claim to be and are thoroughly loyal to our Sovereign Lady the Queen, we do not and will not respect her man-servants, her maid-servants, her oxen and her asses. Charles Kenworthy did his best to extricate Americans from trouble, and Albert Hurd was arrested for attacking the Eureka Hotel. James McGill formed the Californian Rangers supported by [Bill Melody]. Smith and Nelson helped with forming Drilling corps. The Germans were the first organised group of non-English speakers to arrive in Australia. Before the Unification of Germany in 1871 Germans had lived in a patchwork of provinces. Early German arrivals in Australia, mainly farmers and tradespeople, came from Brandenburg, Silesia and Posen. After the revolution of 1848 a number of middle-class Germans arrived from southern provinces including Bavaria. Large numbers of Germans were present on goldfields such as Ballarat, Bendigo and Talbot. Some Germans at Eureka were the Prussian Edward Thonen (killed), William Augustus Heise, Thomas Henfield (killed), John Hafele (killed), Adolphus Lessman, John Herman, Frederich Spanake, Herman Steinman, Frederick William Tauschke, Frederick Vern. Either Edward Thonen or William Emmerman (born Russia) had the faithful dog now known as the Pikeman’s Dog. The 50th anniversary of Eureka was celebrated in 1904 with many of those intimately involved at Eureka fifty years earlier attending reunions. They were identified as diggers or those involved in those stirring times. There were no differentiations between British and Foreign. By 1904 the diggers were getting on in years but they were firmly settled I their adopted land – and living in a country with a Federation of states. 100 years later there was still great interest and debate concerning the Eureka Stockade. An interesting change between the 50th and 150th anniversary was a celebration of the multicultural aspect. When the diggers oath was first uttered on Bakery Hill there was one common cause without thought of cultural borders. The diggers at Eureka ALL swore by the Southern Cross. The wanted a ‘fair go mate’. Apart from a few Australian born participants, like Thomas Dignum, the vast majority of those involved at Eureka were born overseas. They were cutting a path in their adopted land for us to follow. If we take the first definition of Foreigner form the Macquarie Dictionary - Pertaining to, characteristic of, or derived from another country or nation we get an answer to the role of the foreigner at Eureka. It was EVERY role. Whether defined as Foreign and British subjects they were all diggers on the Ballarat goldfield - not divided by place of birth, but united under the Southern Cross. This page was last edited on 24 February 2019, at 05:27.